Howdy there bloggers! You’ll no doubt remember that when we acquired Gravatar.com, just over a year ago, we intended to fully integrate it into WordPress.com. It’s been a long time coming, but we’ve finally replaced the WordPress.com avatar system with those Globally Recognized Avatars. What does this mean? It means your WordPress.com avatar can now follow you around the web. 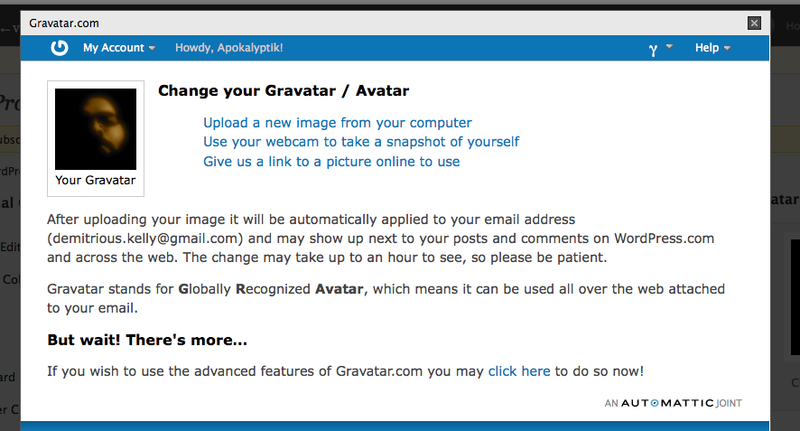 Your avatar can show up on any Gravatar enabled site, regardless of its affiliation with Automattic! The old avatar tool in your WordPress.com profiles has been replaced with your current Gravatar (left.) If you click on that icon you’ll be taken to Gravatar.com (and automatically logged into your account) where you can easily change your image (right). You can upload an image from your computer, paste in a link to an image on the internet, or even take a picture of yourself using your computers webcam. Cropping and rating your images are as easy as ever. After you finish your new image will automatically attach to your email address (assuming you only have one email address on your account,) or you will be presented with a simple-as-pie list of your email addresses, and you can attach the new image to any or all of them! Just close the Gravatar window when you’re done. Of course all of the standard Gravatar features are available to you. Upload as many images as you wish, switch them as often as you like, add as many email addresses as you want to your account, and more features still in the works. If you find that you have an “old” image for your Gravatar, simply click on the link to change it and then click on the “Use your last WordPress.com Avatar” link to get the new one back. There are bound to be some small hiccups here and there. Just let Support know when something doesn’t work quite right, and we’ll get everything ironed out in no time. Thanks for contstantly upgrading the wordpress community . Sweet thanks for the upgrade. I think cranky old geeks should be read – and not seen. But, I’ll give it a try. Saya sangat bersyukur bisa bergabung dengan WordPress.com, yang semakin hari berkembang semakin canggih, lebih mudah mengakses, lebih spesifik dan lebih up to date. Pencetus/pengelola WordPress, makasih buanyak ats perubahan-perubahan yang selama b ergabung sudah banyak kemajuan. Maju terus di dunia maya, dan saya khususnya siap mendukung untuk perkembangan lebih lanjut. Terima kasih. awesome! this is cool!! WOWOWOWOW! very cool! i’m loving seeing my blovatar around town and now this! yay! thats cool.. thanks for inform me..
that’s exactly why i shifted and will stick to wordpress forever. thanks for the nice job! What are they good for? I suppose that I will have to try it since I’m clueless about this feature. Thanks for the hard work. Gravatars are part of your identity online. They are the images that appear next to comments you leave on any gravatar-enabled blog. And, as for a cool offline use, Gravatar images were used to create badges for WordCamp San Francisco 2008. Pretty neat! Check out http://en.gravatar.com/site/about to find out more about Gravatars. Um, I blog anonymously. Does this mean I need to make a new email address for my blog? Your Gravatar is connected to your email address, so if you leave comments on another blog and you want to remain anonymous, make sure that the Gravatar connected to that email address is an appropriate image. Thats a nice feature, the favicons especially. A new feature every week and you people keep reducing the reasons one needs to go for a self-hosted blog. gravatar on old comments will change too when I change my gravatar now? That’s right, as long as the images next to the old comments are Gravatars, they will change when you update your Gravatar through your WordPress.com profile or at http://gravatar.com/. This is cool. Thanks, WordPress community 🙂 Thank you for this feature. I’ve tried it just now… but it seems like you have to wait a lil bit long until your gravatar changed. Your Gravatar should update right away. However, some browsers may take a while to show new Gravatars. Clearing your browser cache and cookies and completely restarting your browser may help. I don’t know why I struggled for so long on a self-hosted blog. Even all my old comments show the new Gravatar image. Cool, im gonna try it out right now! A very cool feature to reflect graphically one’s profile -> via Gravatar. Can a gravatar be animated? or contain a smiley ? Gravatars cannot be animated. The only way to include a smiley would be if the smiley was a static graphic that was part of the image. Yep, I’ve noticed. It was a good idea and most of my friends also thought so. Speaking on the behalf of those, who do not know English. Greetings! Is this the explanation for the picture of myself – that I have been using happily since I started blogging here – suddenly disappeared and was replaced by a random pattern? That random pattern is called an identicon. If you see a random pattern instead of your Gravatar, then you should check your WordPress.com profile page to make sure your image is showing up properly there. Also, keep in mind that blog Administrators can choose whether or not to show Gravatars from their Settings -> Discussion page. If your Gravatar is not showing up on a blog, then they may have chosen not to display Gravatars. I think I remember that Gravatar is also a default for IP Board (popular forums). I’d like to have an option to not have a Gravatar. It seems that once you have one, you either have to either have a pictures or show a blank white space. It would be nice to say – no Gravatar please – it would save space on my RSS reader. You can delete your Gravatar if you’d like. To do that, simply hover your mouse over the image in the list at the bottom of your Gravatar manage page, and click the red	“X”. See http://en.gravatar.com/site/faq/ for more Gravatar questions and answers. Ah, cool. Nice to not have to update two sites any more. Good job. Can we forget the word Blavatar then? Or are they two different things? They are different. A blavatar is a blog avatar and it is displayed in the web address bar next to your blog URL. A Gravatar is a globally recognized avatar and it is displayed next to your comments, in the Authors widget, and some other places depending on how your theme was designed. Gravatars can be used on other websites and applications too. You could see your gravatar on any web-enabled blog or website. Thanks so much for all the integration! so if I leave comment use another email address that isn’t connected to Gravatar, my gravatar isn’t show up..? I think Gravatar is a nice feature hope to come up with a picture !Thanks WordPress! I hope that more sites have the option to use the gravatar available. Cool and seems very nice, thanks. Blavatars, Gravatars…it’s getting a little dizzying, folks! I loved the new feature. I’m just learning about all this. Looks very cool! Thanks! Thank you for your hard work, WP! It must be fun to leave us luddites in the dust. But it sure is exhausting trying to figure out that “write” is now “post” and you can’t save a draft anymore. Ever thought of giving us a choice NOT to update? Ah, DOS. Now THERE was a program. . .
haha the members of wordpress are so polite. Thank you kindly mr. word press. Very good. Thanks, innovation without stoping …. Gravatars are just awesome, thanks! Ah WordPress.org! Nice… As usual. Great job!!! j. Es muy interesante. Gracias. Felicitaciones. Thank you WP community for this great effort. More power! This is awesome! I think the gravatars add a lot of character and personality to the blogs. There’s a lot of funny pictures that can be used, if you decide to quit showing your mug, or if you have other characters (which seems to happen on my blog). Thanks a lot. thats Great! Good, good. Now how about enabling adsense? Pretty cool stuff. A quick glimpse at the future. 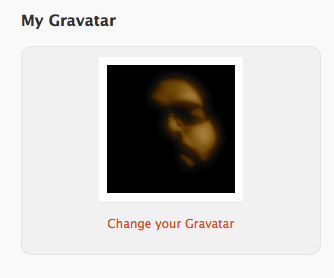 The one thing you guys seem to not want to do with gravatars is to make them act like the Post Avatars plugin for WP. There you can choose an image to go at the top of your post, similar to LiveJournal. Blogs with multiple authors would particularly benefit from this, and it seems to me easy to implement on WP.com. That’s really the only use I see for Gravatars in this context 9and outside of comments). my computer freezes for a minute everytime i get on a website with the snow. why is that? That’s great news! Thank you! Great changes! Looking forward to what other improvements you guys make. Please disable right-click on the gravatar — then the thiefs cannot steal your gravatar and use it to make posts under your name. But thanks for a great product ….. I think it is great. Now I needn´t care about my avatar in the Internet. Now I have my personal signature (I mean avatar) everywhere. Thank you a lot. Beautiful! Avatars can now roam the Blogosphere and beyond!